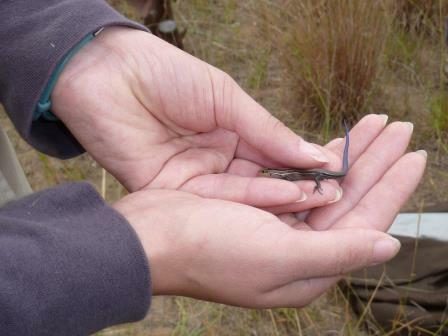 BRANDON, MB – Manitoba’s only lizard, the endangered northern prairie skink, will receive new protection thanks to efforts by a researcher from Brandon University (BU). Dr. Pam Rutherford, Associate Professor in the Department of Biology, has convinced the Canadian Herpetological Society to designate Spruce Woods Provincial Park an Important Amphibian & Reptile Area. The park, an hour’s drive southeast of Brandon, is the only place in Canada where the lizards have been found. The northern prairie skink is a small brown reptile about the length of your hand. Juveniles have bright blue tails but the colour fades when they mature.